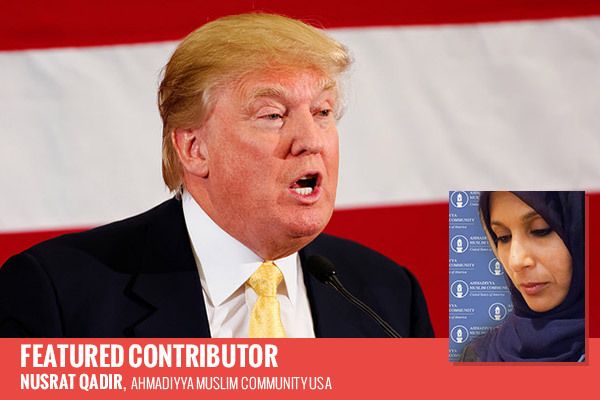 Featured Contributor Nusrat Qadir implores Americans to counter fear and hate by inviting Trump and his followers to learn more about True Islam. Recently acclaimed author, lawyer and news commentator Qasim Rashid of the Ahmadiyya Muslim Community was nearly struck down in a parking lot while accompanying his two young sons. As if that wasn’t frightening enough, a passerby added insult to injury by shouting “"YOU F—ING FOREIGNERS. GET THE HELL OUTTA MY COUNTRY. YOU'RE A DISGRACE!" Mr. Rashid and his children were notably shaken by the incident, but Qasim took it upon himself to not respond with his own choice words and adhere to the Quranic guidance of, “And the servants of the Gracious God are those who walk on the earth in a dignified manner, and when the ignorant address them, they say, ‘Peace!’" Chapter 25:64. His six-year-old son Hassan, however, needed to express himself and did so by writing a note to Republican Presidential candidate Donald Trump. Now while it is no news that Mr. Trump’s rhetoric has garnered his attention of like-minded individuals, what is shocking is that a six-year-old was also aware of what Mr. Trump’s statements are causing. Hassan is not alone in recognizing Donald Trump cruelty. Little eight-year-old Sofia also expressed her fear upon hearing his remarks. She was fearful she would be deported and routinely checked the lock on her front door. Her mother chose to post the situation on Facebook and she received the outpouring of support not only from friends but strangers including members of the United States Armed Services. Indeed, the support of strangers has comforted these two children in feeling welcome in the America they were born to live in, but what about the countless other children growing up Muslim in a time when open rhetoric against their faith is accepted as the new norm? Proud of PM Trudeau for condemning Trump for his position on banning Muslims, that is leadership ! Divisive rhetoric harms us all ! Donald Trump and those like him have chosen to capitalize on fear by stirring up hateful rhetoric that gains them attention. 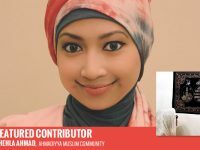 By preying on this fear, Muslims have noted an increase in mosque bomb threats and shootings, vandalized mosques, lone wolf attacks, and other crimes of hate. This level of divisiveness continues to thrive in the market of Islamophobia more so after the horrific terrorist attacks in Paris and San Bernardino by people claiming to adhere to the tenants of Islam. The act of a few so called Muslims has led to the generalization of many. Trump's followers hateful actions are not being categorized to one group of people or religion, unlike the religion of Islam which is unfairly demonized as the cause of the hate expressed by the few who use it to justify their brutal attacks. 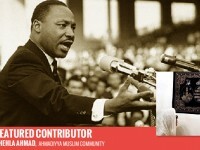 As a result, the fear of Islam has dominated the hearts of many rather than the fear of hate. Hate and ignorance are what causes extremists to behave violently and is, sadly, in turn, the response of those trying to address it. And while the primary target of Daesh is Muslims, in the West it also appears that the attacks based on fear victims are also Muslims. Clinton goes after Trump a second time today. His rhetoric on Muslims is "not only shameful –it's dangerous"
Trusting our government to continue with the surveillance and counterterrorism action implemented since post 9/11 is a proactive method in dealing with Daesh. But how do we counter the fear that has surfaced and been magnified upon by the rhetoric of hate? Many Muslims suggest to do what Qasim Rashid has done. Use this as a teachable moment and counter the fear by inviting Trump and his followers to learn more about True Islam. To recognize that those who create chaos are a few within Islam and that the more we create dialogue, the more we can work together to combat extremism. His Holiness Mirza Masroor Ahmad, the Khalifa of Islam, has launched the effort of True Islam versus the Extremists to educate both Muslims and non-Muslims on the true teachings of Islam and root out any fanatical ideologies. Dividing us will not be a way to counter the radicalization of those who take the extreme route to deal with their political agenda. Daesh along with Trump use fear as a method to control the masses and its time the masses take control of the narrative to stop the fear and hate with truth and education in our fight versus the extremists.